In Wing Tsun there is no footwork to learn, as only the instinctively way to move as a human being, will work in a stressed situation. The only workable footwork are the natural foot movements - "as when walking the streets" - Miyamoto Musashi - which automatically ensures body stability, when always facing the opponent with body frontality and a constantly forwarding hip pressure. Even in extreme situations when forced into "Advanced Footwork" (7.M.Y.C.) it is the pressure, that dictates the way of returning to basic - "Falling Leaf". Therefore the basic footwork schedule describes the natural movements when punching or receiving pressure. In a real situation always be in Fighting Stance - NOT IRAS, and make sure to maintain a 50% 50% weight distribution on the feet, to avoid non optimal situations requiring "Advanced Footwork". ‘In my strategy, the footwork does not change. Short Step into Fighting Stance (3.B.4.) either forward og backwards left or right, depending on the side of the hip/leg delivering or receiving the pressure. Never ever use IRAS before or during actual fighting, as it is only for training purpose in order to detect the power leg defining the rotaing/moving direction when punching or receiving pressure. Chasing Step (Shuffle) forward maintaining direction and the rear leg. Chasing Step (Long) forward changing direction and the rear leg to new front leg. Shuffle Step backwards maintaining direction and the rear leg. Long Step backwards changing direction and the front leg to new rear leg. Backwards by moving the leg at the side of the hip which receives the incomming pressure. Forward by using the leg at the side of the hip which receives the recoil pulse. The angle towards the opponent (WT Lines) when moving, either forward or backwards, is proportional to the wrist rotations (Unit Circle). 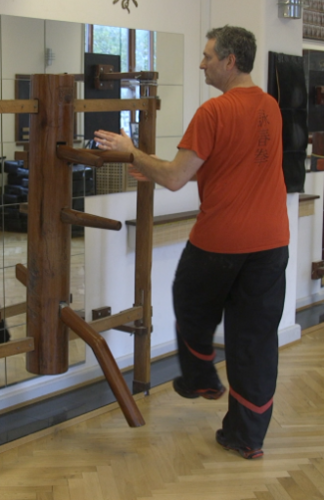 As Wing Tsun is no sport, but a selfdefense system without rules, an attack can happen any time without prior warning and without facing the attacker. Therefore we never anticipates, only reacts explosivily with the arms (Punch - Walk), when the attackers Coreline is within a "short distance". Action equals reaction - The DAR pulse will recoil into the power-/rearleg and release the hip/knee "turbo" tension, sending the body equally forward, with the legs to follow in order to stabilize the body, "as when walking the streets" - Miyamoto Musashi. When the above optimal no longer is possible Due to to much weight at one leg, and being pushed or dragged, the Advanced Footwork "kicks" in. However it still happens automaticly/naturally based on the the above "rules", of getting rid of the force and return to full frontality with the optimal weight distribution - 50% / 50% on each leg. The natural human structure always allows the body to return to its natural structure, no matter the situation, ending in full control with a "possible" deliberately neutralization of the attacker. "Rescue" Step backwards with front leg in the pushing direction to deflect pressure, ending with the front leg in the new attacking Line direction after regaining frontality. 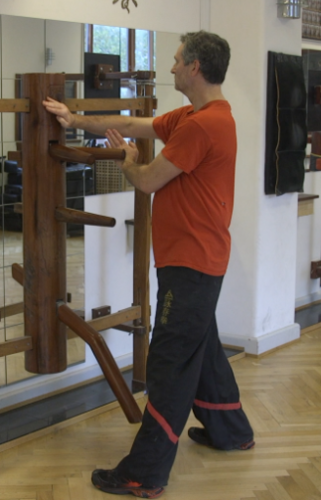 "Rescue" Step forward (Ghost Step) with front leg in the pull direction to neutralize pressure, ending with the front leg as rear leg in the new attacking Line direction after regaining frontality.